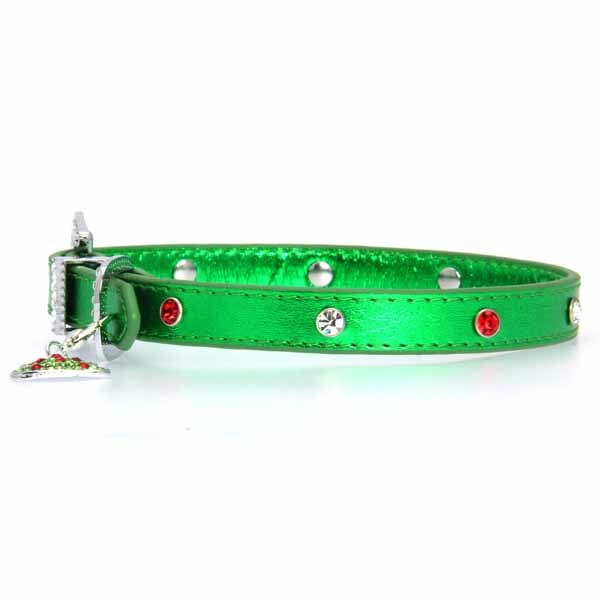 Dazzle your pet's admirers this holiday season with a gift of this sparkly Christmas Dog Collar with a Christmas Tree Charm in Metallic Green! 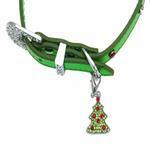 The Christmas Dog Collar with Christmas Tree Charm in Metallic Green by Cha-Cha Couture is perfect for those with an eye for bling. 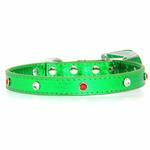 This festive holiday dog collar features a metallic green finish with red and clear crystals alternating around the band. For extra sparkle, the buckle, D-ring, and loop are all embedded with clear crystals. The tree charm included with this dog collar is covered in high-quality crystals and features a lobster clip to attach to any D-ring. This is a beautiful holiday dog collar that sparkles from every angle! Makes a great gift for the dog lover or your own pooch. Foxy Metallic Green Christmas Collar w/Christmas Tree Charm by Cha-Cha Couture Customer Photos - Send us your photo! Christmas ready? For sure with this gorgeous holiday collar for my diva Destinee. Of course it is a Couture. Well made and super blingee. A Nice collar, Fits my dog perfectly, nice and strong. I would recommend to anyone. Posted On 12/24/18 by cynthia h from terre haute, IN Yes, cynthia h recommends this product! These cute holiday collars are perfect for Christmas. I bought three, one for each one of my Cavalier King Charles Spaniels. So cute and you cant go wrong at this price! Very well made, cute adorable charm attached. Posted On 12/20/18 by Biloxi from Biloxi, MS Yes, Biloxi recommends this product! Posted On 12/20/18 by Amanda H from Baltimore, MD Yes, Amanda H recommends this product! This collar is a festive green color with silver and red gems. The collar also has a Christmas tree charm that can be detached from the collar and clipped somewhere else. Posted On 11/25/18 by Monica G from North Jersey, NJ Yes, Monica G recommends this product! Perfect for the holiday season! A bit of Christmas sparkle. My dogs love these... they are easy to see them while playing in the snow! I got three of this collars just in time for Christmas! My 3 dogs will be wearing them to daycare for the holidays. Very bright and cheerful collars!